In this study, 57 cell blocks were prepared among which 55 were prepared from aspirates from intrathoracic (IT) mass and 2 were prepared from bronchioalveolar lavage (BAL) fluid. Among these, 36 cell blocks were malignant, 5 of which were small cell carcinoma, 30 were NSCLC, and 1 case was of Ewing's sarcoma. Among 30 cases of NSCLC, 8 were squamous cell carcinoma, 18 were adenocarcinomas, 2 were undifferentiated carcinoma, 1 was adenosquamous carcinoma, and 1 was adenocarcinoma with neuroendocrine differentiation. There were 8 cases which were nonmalignant and 13 cell blocks were inadequate (these were given a diagnosis of malignancy on histology). The main reason for inadequacy was scant neoplastic cells, or hemorrhagic background or when cell block contains normal cells only. The study group comprises of 22 cases of NSCLC, which have adenocarcinomatous component. 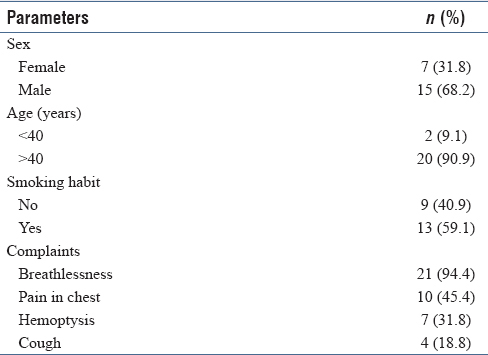 The clinical profile of the patients is given in [Table 1]. The age range of adenocarcinoma patients at presentation was 27–70 years with a mean age of 55.1 years. The male to female ratio was 2.1:1. In order to determine the cell block efficacy to detect EGFR and ALK in NSCLC, the expression of IHC markers were compared for biopsy (gold standard) and cell block on 22 samples that have adenocarcinomatous component. On biopsy, 20 (90.9%) cases were negative and 2 (9.1%) cases were positive for EGFR. Both the cases showed positivity for mutation-specific antibody for exon 19 (E746-A750) deletion. On cell block, similar results were obtained. We observed high correlation between results of biopsies and cell blocks for EGFR detection by IHC with a sensitivity of 100%. Results of IHC expression of ALK on biopsies and cell blocks also showed high correlation with 1 case positive for ALK both on biopsy and cell block and other 21 cases were negative for ALK antibody expression both on biopsies and cell blocks [Figure 1], [Figure 2], [Figure 3]. The sensitivity of ALK detection by IHC on cell block is 100% compared with biopsies. Rosell R, Moran T, Queralt C, Porta R, Cardenal F, Camps C, et al. Screening for epidermal growth factor receptor mutations in lung cancer. N Engl J Med 2009;361:958-67. Dogan S, Shen R, Ang DC, Johnson ML, D'Angelo SP, Paik PK, et al. Molecular epidemiology of EGFR and KRAS mutations in 3,026 lung adenocarcinomas: Higher susceptibility of women to smoking-related KRAS-mutant cancers. Clin Cancer Res 2012;18:6169-77. D'Angelo SP, Pietanza MC, Johnson ML, Riely GJ, Miller VA, Sima CS, et al. Incidence of EGFR exon 19 deletions and L858R in tumor specimens from men and cigarette smokers with lung adenocarcinomas. J Clin Oncol 2011;29:2066-70. Takahashi T, Sonobe M, Kobayashi M, Yoshizawa A, Menju T, Nakayama E, et al. Clinicopathologic features of non-small-cell lung cancer with EML4-ALK fusion gene. Ann Surg Oncol 2010;17:889-97. Nathan NA, Narayan E, Smith MM, Horn MJ. Cell block cytology. Improved preparation and its efficacy in diagnostic cytology. Am J Clin Pathol 2000;114:599-606. Kato Y, Peled N, Wynes MW, Yoshida K, Pardo M, Mascaux C, et al. Novel epidermal growth factor receptor mutation-specific antibodies for non-small cell lung cancer: Immunohistochemistry as a possible screening method for epidermal growth factor receptor mutations. J Thorac Oncol 2010;5:1551-8. Nakamura H, Mochizuki A, Shinmyo T, Ando K, Kurimoto N, Yokote K, et al. Immunohistochemical detection of mutated epidermal growth factor receptors in pulmonary adenocarcinoma. Anticancer Res 2010;30:5233-7. Lee JA, Bubendorf L, Stahel R, Peters S. Testing for anaplastic lymphoma kinase rearrangement to target crizotinib therapy: Oncology, pathology and health economic perspectives. Expert Rev Anticancer Ther 2013;13:625-36. Yi ES, Chung JH, Kulig K, Kerr KM. Detection of anaplastic lymphoma kinase (ALK) gene rearrangement in non-small cell lung cancer and related issues in ALK inhibitor therapy: A literature review. Mol Diagn Ther 2012;16:143-50. Pawar S, Sameer MA, Ahuja M, Patil A. 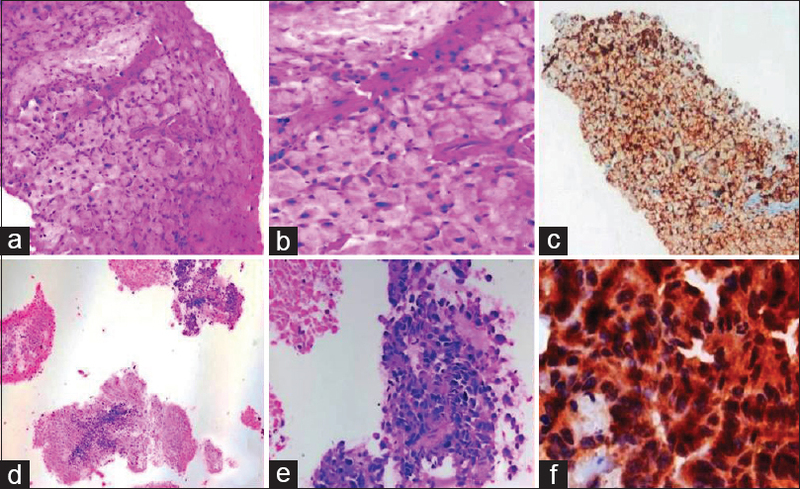 Sensitivity and specificity of cell block method in diagnosis of lung malignancies. IOSR J Dent Med Sci 2016;15:86-99.